Dog camp is a 2 hour off leash hike in the woods. 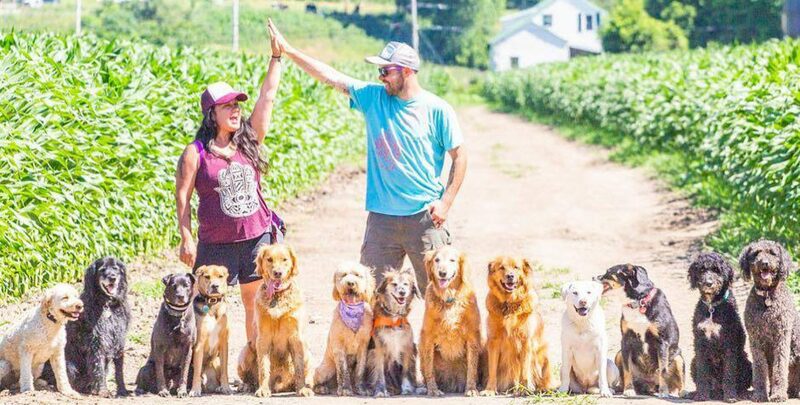 Dogs get picked up at their homes between 8:30- 10am and after a 2 hour off leash hike they get dropped back off 12:30-2pm – Dogs that do well in camp are dogs with a high social drive. A social drive for other dogs, they love to play, or a social drive for people, they do not like to leave the dog camp providers side. Camp is for dogs that do well with other dogs, do well in a car and stick around a dog pack- does this sound like your dog? Contact us cause dog camp is dog bliss! Right now Joe and I are taking new camp clients! we have openings Wednesday, Thursday and Friday! If we are not in your pick up area or happen to be learning new dogs and can not take your dog at the moment check out other camp providers listed under ours.